Ongoing and, in some areas, increasing geopolitical concerns are causing a rise in political risk exposures with 55% of global organisations with revenues greater than US$1bn experiencing at least one political risk loss exceeding US$100m in value. This is according to figures from Willis Towers Watson, whose annual Political Risk Report, carried out with Oxford Analytica, highlights Turkey and Argentina as particular areas of concern. The most frequently reported political risk related loss was exchange transfer which impacted nearly 60% of those experiencing losses, followed by political violence (48%) and import/export embargos (40%). The key geopolitical threats were seen as US sanctions policy, emerging market crises, protectionism/trade wars, and populism and nationalism. Some 60% of research participants reported that political risk levels had increased since last year, and nearly 70% stated that they had scaled back operations in a country as a result of political risk concerns or losses. Chairman and CEO at Willis Towers Watson Financial, Paul Davidson says with these rising levels of risk, companies will begin to fall under scrutiny around the related losses. Research interviews for this study were conducted with senior executives of 40 global firms across different industries including food and beverages, oil and gas, mining, pharmaceuticals, real estate, automobiles, and utilities, with in-depth follow-up interviews with 10 of the participants. The companies are mainly headquartered in North America, Europe and Japan and have extensive global operations, higher risk regions included. • While Russia and Vietnam were most frequently cited as countries where losses occurred, losses were recognised throughout Europe, Latin America, APAC, Africa and the Middle East. • More than 70% reported holding back from planned investment as a direct result of political risk concerns. • Larger companies were more likely to report using avoidance strategies – among companies with more than US$1bn in revenues, 82% stated that they had scaled back investments, and 86% had avoided future investments. Companies most frequently reported scaling back investments in Nigeria, Iran, Russia and Venezuela. 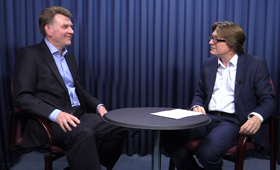 Mark Evans talks to Barry Menzies, head of MIDEL ester-based dielectric fluids, at specialist manufacturer M&I Materials, to discover how ester fluids can help reduce the risks associated with transformer applications.